in the immediate vicinity of this point, where . Here, is a small real constant. We introduce in our analysis principally as a mathematical artifice to ensure that remains single-valued and finite. However, as will become clear later on, has a physical significance in terms of the damping or the spontaneous excitation of waves. and . This equation is singular at the point . Thus, it is necessary to introduce a branch-cut into the complex- plane, so as to ensure that is single-valued. If then the branch-cut lies in the lower half-plane, whereas if then the branch-cut lies in the upper half-plane. (See Figure 6.1.) Suppose that the argument of is 0 on the positive real -axis. It follows that the argument of on the negative real -axis is when , and when . 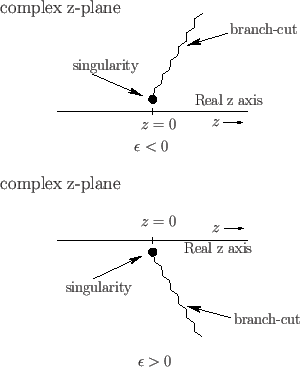 Figure: Branch-cuts in the -plane close to a wave resonance. where and are two arbitrary constants. ensures that the expressions (6.35) and (6.40) are indeed identical. A comparison of Equations (6.52) and (6.54) shows that if then . In other words, there is a reflected wave, but no incident wave. This corresponds to the spontaneous excitation of waves in the vicinity of the resonance. On the other hand, if then . In other words, there is an incident wave, but no reflected wave. This corresponds to the total absorption of incident waves in the vicinity of the resonance. It is clear that if then represents some sort of spontaneous wave excitation mechanism, whereas if then represents a wave absorption, or damping, mechanism. We would normally expect plasmas to absorb incident wave energy, rather than spontaneously emit waves, so we conclude that, under most circumstances, , and resonances absorb incident waves without reflection.